Hilton Canopy Hotel in Ithaca being built; worker on 6th floor. August 2018. 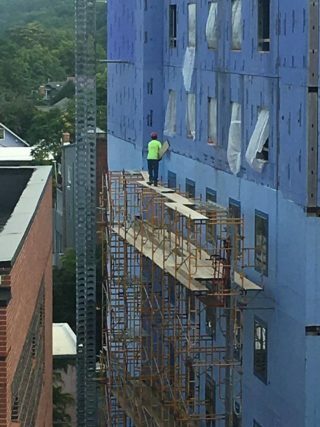 This past year (August 2018), a Tompkins County Workers’ Center (TCWC) Member provided pictures to the TCWC of what we believed to have been dangerous working conditions at the Hilton Canopy Hotel Development construction site in downtown Ithaca. The Occupational Safety and Health Administration (OSHA) inspected the site and has recently found conditions in serious violation of OSHA standards. The general contractor, William H. Lane, Inc. of Binghamton, and the subcontractor, CFI Sales and Service in Brackney, PA, both said in August 2018 that the worksite practices were fully compliant. William H. Lane has ‘informally settled’ on a $4,000 fine from OSHA. CFI Sales and Service which employed the worker in question is contesting the $22,542 OSHA fine. The developers of this Hotel got a very generous tax break from the Industrial Development Agency (IDA) in Tompkins County. The IDA does not require a Project Labor Agreement (PLA) for a project to be deemed worthy of an IDA tax break. NOR is a ‘prevailing rate of wage and supplements‘ required. Such unsafe working conditions found at the Hilton Canopy are less likely to happen when the developer and general contractor enter into a PLA and partner with unions, who know a lot about Safety & Health practices. This, of course, indicates an overall RESPECT for workers, which we believe EVERY employer should champion. The Tompkins County Workers’ Center encourages our community members to speak out–be the eyes and ears of the community, such as our TCWC Member did–when you witness unsafe working conditions and other illegal employment practices. The TCWC provides workplace safety and health training for workers and employers in our region.